Do you want to save money on your campaigns by cutting out the middleman? Would you like to get more traffic for the same ad spend by sidestepping your competitors? Instead you make an agreement with that publisher for a $1.50 CPM. This way you’ll both make more money! You’ll save 25% on your ad spend, and the publisher makes 25% more revenue. Neither of you needs to deal with the uncertainty and instability of a traffic network. The publisher gets a consistent income stream, and you’ll know exactly where and when your ad is showing up. It’s a smart strategy for obvious reasons. But when you dig deeper, you start to realize that there are many more hidden benefits to making direct media buys. Don’t get me wrong…I’m not suggesting you should cut out ad networks entirely. I’m a media buyer, after all. These platforms are my bread and butter, and there are some big advantages to using them. At the same time…traffic networks also have some MAJOR drawbacks. Reason #1: You’ll save 30-50%. Ad networks take 30-50% of your advertising dollar before paying the publisher. Which means for every $10 you spend on ads, only $5-$7 actually goes to the website where your ad shows. In other words, a sizable chunk of your margins are going straight into the network’s pockets. So why not cut out the middleman and keep that extra cash for yourself? Just think of how powerful a savings like this could be. Simply switching from an ad network to a direct buy could instantly transform a losing campaign into a big winner! Reason #2: You don’t have to master a complicated interface. Traffic networks can be insanely complicated to figure out. There are dozens of settings and options for targeting different demographics, placements, device types, locations, and more. It can take years to master all the intricacies of these systems…and even then, you have to dedicate a sizable amount of time just keeping up-to-date with all the latest changes and developments. But with a direct buy, you don’t have to worry about any of that. You can skip the interface entirely, because instead of dealing with a computer screen you’ll be dealing with an actual human being. Reason #3: You’ll develop a relationship with your publishers. But when you place media buys directly with a publisher, everything changes in an instant. You’ll be dealing with people inside the organization who will come to know and like you as a person. They’ll learn about your business and what you have to offer. They’ll be able to give you their inside perspective on what types of offers and creatives are working best with their users. And best of all, they’ll be incentivized to help you succeed. They’ll be willing to work with you to make sure your offer works…because they understand that’s the only way to keep you on as an advertiser. Reason #4: No more worrying about rules and compliance. Ad networks are known for enforcing lots of stringent rules. You have to have certain pages on your site, you have to be careful about your claims and language, and you even have to be careful about the images in your ads and landing pages. You also have to learn and pay attention to network-specific metrics like quality score and relevance score. But with direct buys, your life gets a lot easier. Sure, you may still need to work with publishers to keep your banner ads consistent with their brand standards. But you’ll have more leeway and flexibility, and far less hoops to jump through. Making direct buys also opens up the possibility of using ad types that aren’t available through a network, such as non-standard ad sizes, transitional ads, or even takeover ads. Reason #5: You’ll have less wasted spend. Unfortunately, with these platforms you often up up targeting the same visitors again and again. In other words, you end up paying more to reach the same people. It also leads to rapid ad burnout. With a direct buy, on the other hand, you pick and choose the exact sites that your prospects are already visiting…giving you much more control over scale, consistency, and frequency. Reason #6: You’ll know exactly where and when your ad is showing up. Even today, some networks are still a black box. You may have no idea where your ad is showing up: above the fold? Below the fold? Hopefully not in the remnant inventory. Direct buying changes all that. You know exactly where and when your ad is showing, without having to be constantly manipulating your bids and settings. 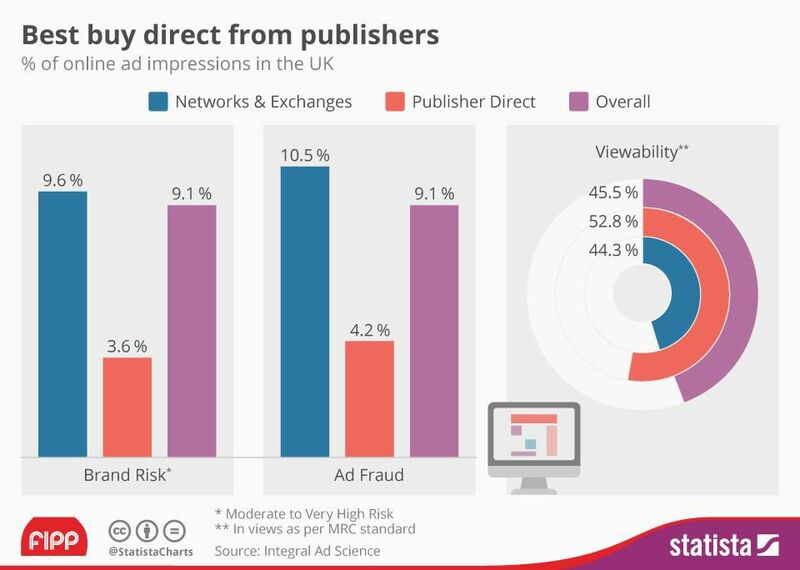 As this data shows, buying direct from the publisher is significantly safer than buying through a third-party network. Reason #7: You’ll wipe out the competition. When you use an ad network, you’re going head-to-head against the biggest companies in the world…companies who often have more money, data, and resources than you do. It can be almost impossible to compete under those circumstances, especially on an auction-style network. This is where a direct buy really shines. By placing a direct buy, you avoid the competition entirely. No more bidding wars against companies who can afford to overpay for every click. You don’t have to worry about inflating prices or competitors ramping up their ad spend. Because the online real estate you just negotiated for isn’t up for any auction; it’s yours. As you can see, there are some significant benefits to using direct media buys. And in this course you’re going to learn how to leverage direct buys to reap all these benefits to get more traffic and sales for less ad spend…while paradoxically making your job easier in the process. And who better to teach this information than Mike Hardenbrook? Direct media buying is a critical skill, and I wouldn’t trust this course to anyone less than an absolute expert like Mike. Mike has made some staggering accomplishments, like building GrowthGeeks.com to $1.2 million in just 18 months. He’s also the co-founder of several other successful companies including Workify and Growth Hacker TV. He’s an advisor at Baylor University (the #2 school in the U.S. for entrepreneurs), and has been featured in Forbes, Entrepreneur, and Entrepreneur on Fire. Obviously that all sounds very impressive. But what I like most about Mike is that he’s a DOER. He doesn’t just talk about the theory of marketing and media buying, like so many other “gurus” out there. He’s actually done this stuff, many times over, in growing multiple successful companies. But when done wrong, it can be a BIG waste of time and money. If you try to do direct buys on your own, without the benefit of Mike’s proven system, you’re going to get fleeced by website owners who are used to taking advantage of beginners. Mistake #1: You don’t choose the right sites to advertise on. This is the most common and insidious mistake I see with direct buys. It happens when media buyers don’t do their homework beforehand to find the right publishers for their offer. Doing this market research isn’t hard…but it is essential. Without it you’ll end up putting your offer in front of the wrong people, wasting your time and your ad spend. Some smaller publishers have an over-inflated idea of what their traffic is worth. And if you don’t come into negotiations with a good idea of what a fair price is (and how much you can afford to pay while still making a profit), you could find yourself overpaying for underperforming traffic. Mistake #3: Your creative isn’t optimized to convert. We’re all familiar with the term “banner blindness.” So why do so many companies still design banners that 99.99% of people are going to ignore? If you want your direct buy campaign to be successful, having the right creative is essential. That means having a high-converting ad that’s placed in the right spot. After all, nothing else matters if people don’t actually SEE your ad and CLICK on it! So what happens when you make these three direct-buying mistakes? If you make the mistakes above, chances are good that you’ll lose money on your campaigns. Because you’re dealing with people here (not a web-based interface), you have lingo, tactics, and negotiations to keep in mind. Many websites can spot a rookie just by your choice of words when you send that first email. And when that happens, they know exactly how to stick it to you without you even realizing it. And before you know it, you’ll end up signing an agreement owing them $30k with no way out and nothing to show for it. A bad media buy can be painfully expensive. So how can you avoid these mistakes and experience all the awesome benefits of direct buys…without losing your shirt in the process? In this course, you’re going to learn how to make direct media buys like a pro. Mike will teach you everything you need to know, starting with market research and going all the way through price negotiation and advanced banner design. When you finish this course, you’ll have a clear process for how to approach direct media buying. And how to create a high-converting ad that’s custom-made for their site (even if you have zero design skills). Along the way, Mike will show you real-life examples from high-performing campaigns and well-designed banner ads. He’ll take you on an over-the-shoulder walkthrough of how to conduct market research, how to use the various tools and extensions he recommends, and how to narrow down your target list of publishers. When you look at the traffic platforms of today and compare them to just a few years ago, you’ll realize that things online change FAST. Twenty years ago there was no Adwords. Ten years ago there were no Facebook ads. Five years ago there were no Pinterest ads. You get the idea. Advertising platforms are growing, changing, and evolving at a rapid pace. What will be the biggest, most popular ad network 5 or 10 years from now? Nobody know. But you can be sure that the digital advertising landscape will be vastly different than it is today. And with all that constant change comes constant education. As a media buyer, it’s your responsibility to be continually learning and improving your skills on all these new traffic networks. Direct buying is a media strategy that has stood the test of time. It worked before the Internet even existed… It worked during the height of the dot-com bubble… It worked during the early days of Adwords and Facebook advertising… And it works today. And you can be certain it’ll work tomorrow, and next week, and 10 years from now. That’s why Bulletproof Direct Buys is such a smart investment for the serious media buyer. You’ll be gaining an incredibly valuable skill…one that will never become outdated or obsolete…and you’ll be gaining it for life. Even more important is the knowledge and confidence that you’re gaining a skill that will gives you a distinct edge over your competitors. As digital media buying gets more expensive, and the price for ads continues to rise, staying competitive will get more and more difficult—especially for solopreneurs and smaller companies. But by using the system you’re going to get with this program, you’ll have the backdoor strategy you need to sidestep the competition and achieve massive scale and profitability in your campaigns. You don’t even have to decide now. Put this Direct Buy advertising system to use for a full 30 days. We know you’ll love our products because our customers write in telling us exactly that every day. Still, just in case we have a 30 day money back guarantee. Tomorrow morning can be the same as today. You could wake up with the same problems, the same high CPMs, and the same low margins thanks to traffic networks that pocket up to 50% of your ad spend. Because when you invest in Bulletproof Direct Buys, you’ll wake up tomorrow with a system that you can use to confidently place media buys that will bring you more results for a lower cost, all while giving you more control over your campaigns than ever before. Just picture your biggest client’s reaction when you tell them you just negotiated a deal with their most profitable publishers that will save them 30% on their ad spend. Do you think that client is going to use you again? Give you a bigger budget? Even refer some more clients your way? And all you need to make that tomorrow a reality is to enroll in this course today. It’s a smart investment in yourself, your career, and your future. Mike’s specialty is building startups quickly using the power of cold email. Recently building GrowthGeeks.com to $1.2 million in just 18 months using primarily cold email. His projects have been written about in Forbes, Inc., & Entrepreneur. Ad Skills courses helped our campaigns go from 1,000 leads per month to 15,000 leads per month.